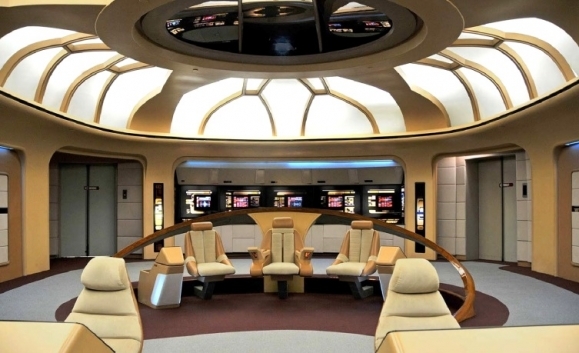 New Starship Foundation will unveil the latest additions to its “Star Trek Enterprise-D Bridge Restoration & Sci-Fi Museum” at Comic-Con International: San Diego 2013. The exhibit will be the Foundation’s largest display of the set, which is a full-scale recreation of the interior of the USS Enterprise from the television series, Star Trek: The Next Generation (http://www.newstarship.com). On Saturday, July 20, New Starship Foundation will host a panel featuring several members of the Star Trek universe. Taking place at 5:30 p.m. in San Diego Convention Center Room 26AB, the panel will discuss all things Star Trek, as well as the New Starship Foundation’s plans to take the Enterprise­-D Bridge Restoration on tour to several cities across the United States and internationally. The group will also reveal details regarding the Foundation’s plan to create a permanent Hollywood Sci-Fi Museum. Among the list of confirmed panelists are screenwriter & novelist David Gerrold; author Larry Nemecek and makeup artist, illustrator & visual effects artist Doug Drexler. Several surprise guests will also join the panel, making it an unforgettable experience for all Trekkies in attendance. For more information, please visit New Starship Foundation online, at http://www.newstarship.com/.